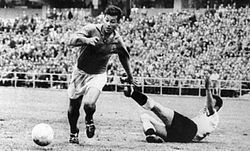 Fontaine playing for France at the 1958 FIFA World Cup. Just Louis Fontaine (pronounced [ʒyst fɔ̃.tɛn]; born 18 August 1933) is a retired French professional footballer. A prolific forward, he is best known for scoring the most goals in a single edition of the FIFA World Cup, with 13 in six matches in 1958. In 2004, Pelé named him one of the 125 Greatest Living Footballers at a FIFA Awards Ceremony. Born in Marrakech to a French father and a Spanish mother, Fontaine moved to Casablanca, where he attended the Lycée Lyautey. Fontaine began his amateur career at USM Casablanca, where he played from 1950 to 1953. Nice recruited him in 1953, and he went on to score 44 goals in three seasons for the club. In 1956, he moved to Stade de Reims, where he teamed up with Raymond Kopa from the 1959-60 season. Fontaine scored 121 goals in six seasons at the Stade de Reims. In total, Fontaine scored 165 goals in 200 matches in the Ligue 1, and twice won the championship; in 1958 and 1960. He also took part in the team that got to the 1958–59 European Cup final against Real Madrid, being that season's top scorer with 10 goals. Wearing the blue shirt of France, Fontaine has an even more impressive record. On his debut on 17 December 1953, Fontaine scored a hat trick as France defeated Luxembourg 8–0. In seven years, he scored 30 goals in 21 matches. However, he will best be remembered for his 1958 FIFA World Cup performance, where he scored 13 goals in just six matches — a feat that included putting four past defending champions West Germany. It was also the highest number of goals ever scored by one player at a single World Cup tournament – a record that stands today. This tally secured him the Golden Boot. As of 2018, he remains fourth-top scorer in FIFA World Cup history, with each of the three ahead of him - Gerd Müller (14 goals), Ronaldo (15 goals) and Miroslav Klose (16 goals) - having played in at least two tournaments. Fontaine played his last match in July 1962, being forced to retire early (28 years and 11 months old) because of a recurring injury. He briefly managed the French national team in 1967, but was replaced after only two games, both friendlies that ended in defeats. As coach of Morocco, he led the Atlas Lions to 3rd in the 1980 African Cup of Nations, overseeing the emergence of such players as Badou Zaki, Mohammed Timoumi and Aziz Bouderbala. Morocco reached the final stage of 1982 World Cup qualifying but were beaten by Cameroon. With Eugène N'Jo Léa he founded the National Union of Professional Football Players in 1961. He criticized the performance of the French team in the 2010 World Cup in South Africa, particularly on the lackluster playing by the forwards. France were eliminated after group stage, with a draw against Uruguay and losses to Mexico and South Africa. Source: "Just Fontaine – Goals in International Matches". Rsssf.com. Retrieved 28 April 2011. France score listed first, score column indicates score after each Fontaine goal. ^ "Entreprise Fab Amenagement Constructions Sports" [Company Fab Amenagement Constructions Sports] (in French). Manageo. Retrieved 2 February 2019. "Just Fontaine". BFM Business (in French). Retrieved 2 February 2019. ^ Kaufman, Michelle. "Countdown to the World Cup – Total Soccer, Fútbol Total". MiamiHerald.com. Retrieved 28 April 2011. ^ "1958 FIFA World Cup star: Just Fontaine". Retrieved 31 December 2016. ^ "1958 FIFA World Cup Sweden ™". FIFA.com. Archived from the original on 16 October 2013. Retrieved 28 April 2011. ^ "1958 World Cup: Wales' Finest Hour". thefootballhistoryboys.blogspot.co.uk. ^ "Golden Players take centre stage". Archived from the original on 12 March 2004. Retrieved 11 June 2008. ^ "France legend Fontaine blasts forwards". ESPN. 11 July 2010. Archived from the original on 27 April 2011. Retrieved 28 April 2011. 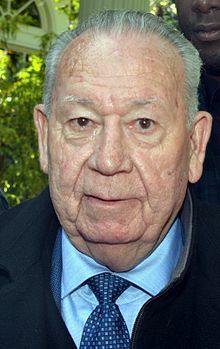 ^ "Just Fontaine - national football team player". EU-Football.info. 14 July 2016. Retrieved 14 July 2016.